The First National Proclamation of Thanksgiving was issued by the Continental Congress in November of 1777, following the Colonial victories over British General John Burgoyne in the Battles of Saratoga. In the Proclamation, Congress "recommended to the legislative or executive Powers of these United States to set apart Thursday, the eighteenth Day of December next, for Solemn Thanksgiving and Praise." Near the end of the Revolutionary War—after the British House of Commons had voted to end the war in America, but before the formal signing of the Treaty of Paris—the Congress proclaimed another Day of Thanksgiving, to be held on November 28, 1782. But the first Thanksgiving Day celebrated under the new Constitution took place on November 26, 1789, the first year of George Washington’s presidency. 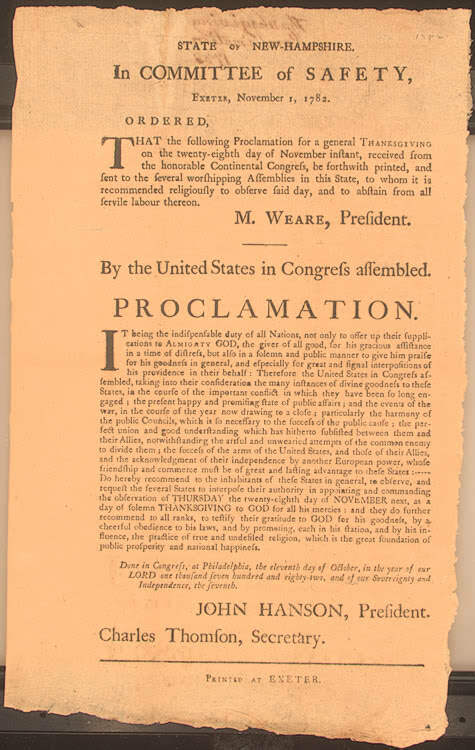 President Washington issued this proclamation recognizing November 26 as “a day of public thanksgiving and prayer.” John Adams and James Madison also issued proclamations calling on Americans to observe certain days with fasting, prayer, and thanksgiving, but after Madison no President of the United States issued a proclamation for Thanksgiving until Abraham Lincoln. In 1939, President Franklin D. Roosevelt moved the holiday to the third Thursday of November to lengthen the Christmas shopping season. After a storm of protest, Congress established the Federal Thanksgiving Day holiday following the passage of a joint resolution, H.J. Res. 41, by the House of Representatives on October 6, 1941, declaring the "last Thursday in November a legal holiday." The Senate then passed an amendment "making the fourth Thursday in November a legal holiday." On three (3) separate occasions today as I listed to the TV Station AWE, they read President Calvin Coolidge’s Thanksgiving Day Proclamation for the year 1929. At 81 years of age, this is the first time I have ever heard a proclamation by any president for Thanksgiving Day. I immediately went to my pc and was so delighted to find so many from our presidents! I am so inspired by this that I am passing on this site to all of my contacts along with my best wishes for a Happy Thanksgiving Day and asking them to remember, along with myself, just why we have such a special day of thanksgiving. How soon we forget! The first national Thanksgiving Proclamations were those issued by the Continental Congress between 1777 and 1784. The amendment also passed the House, and on December 26, 1941, President Roosevelt signed this bill, for the first time making the date of Thanksgiving a matter of federal law and fixing the day as the fourth Thursday of November.